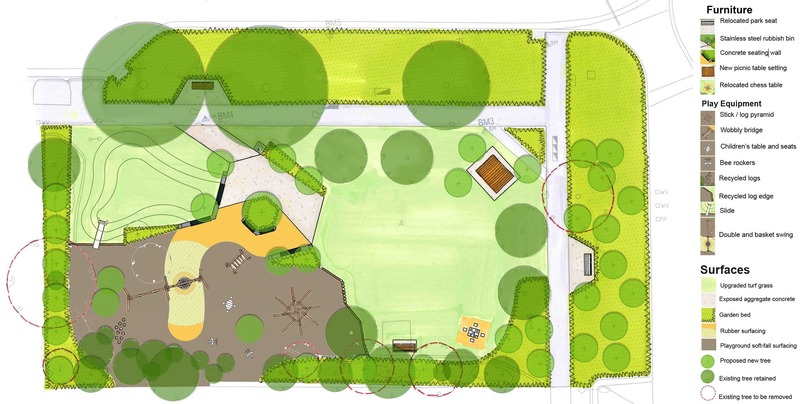 We welcome your comments on the final landscape design including a few options for the play equipment. Complete the survey by 13 December. What's in the park design? The design of the nature strips and removing the triangular bluestone garden bed aims to open the current lawn area across the footpaths and into the nature strips and make them feel part of the Park. Garden beds along Charnwood Road and Crimea Street will provide a buffer to vehicle traffic, especially for children. 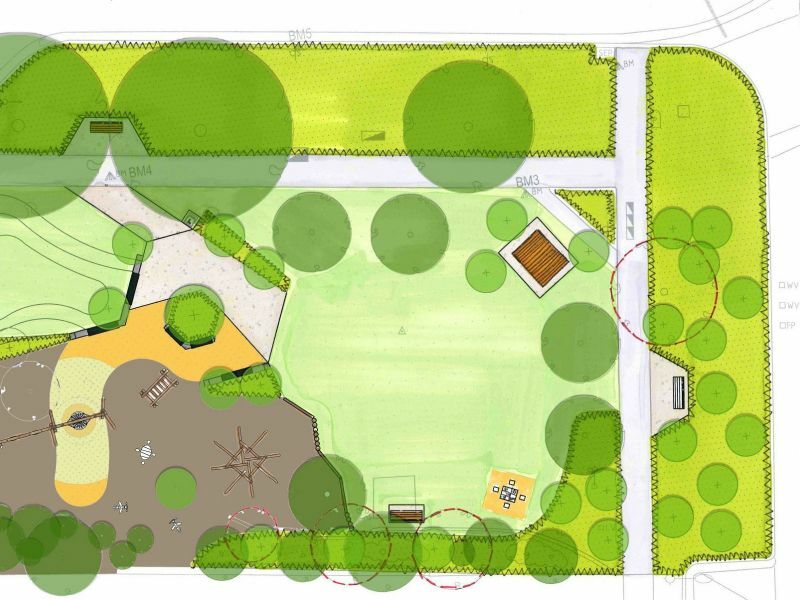 The playground is proposed to consist of both nature play and traditional elements and will provide for climbing, swinging, balancing, rocking and nature-based imaginative play. The grass mound will be raised to incorporate a slide with rubber play embankment and natural stone staircase. 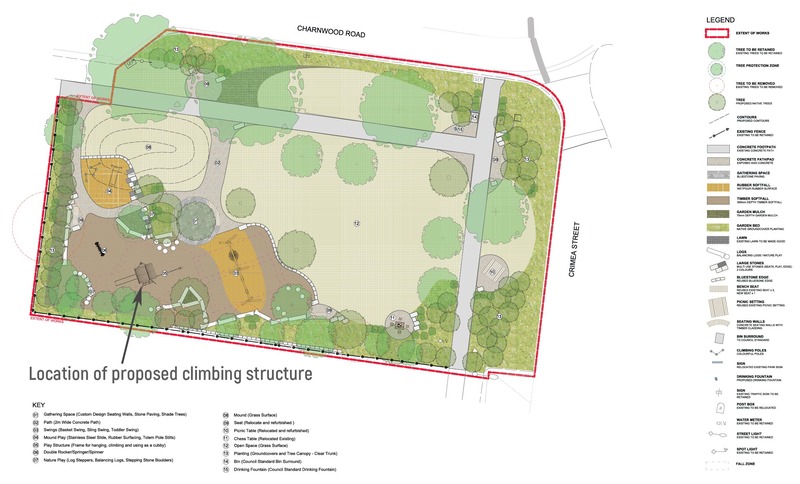 A concrete pathway from the Charnwood Road side will provide access into the park and playground - to a paved area with seating and an accessible rubber soft-fall path into the playground. New concrete and timber seat walls will surround the paved area. Three Council-standard park benches and a picnic setting will be installed on concrete pads and will provide locations to sit quietly away from the playground. The existing chess table will be relocated and installed onto a concrete pad. Rubbish and recycling bin enclosures and a drinking fountain are new additions. The design includes numerous new and improved garden beds with robust and attractive plantings. The existing garden beds will have the bluestone edges removed and will be re-planted. The existing grass nature strips will be planted with new lawn, garden beds and trees to enclose and enlarge the Park, act as a buffer to the roads and increase biodiversity. New trees will provide shade. Some of the existing exotic trees and plants will be removed as part of this project and any trees to be removed will be subject to Council’s formal community notification process. 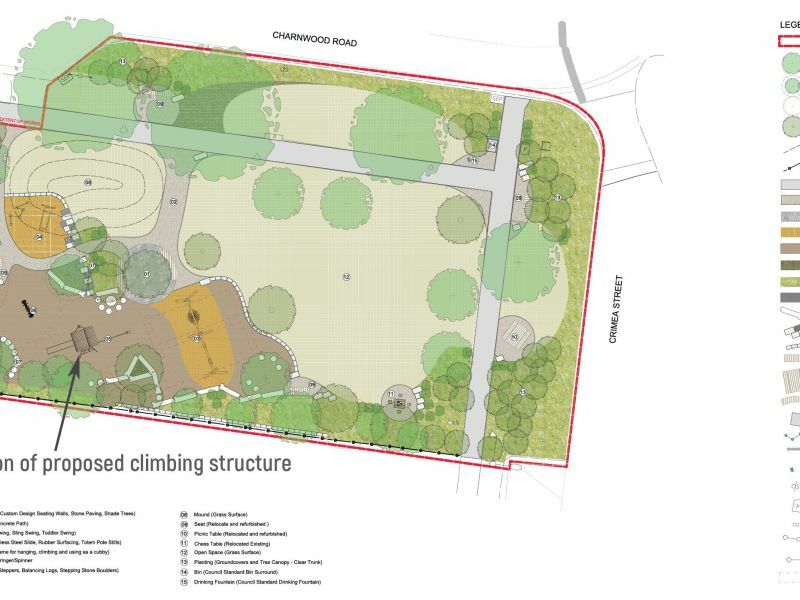 Council is upgrading Chipton Park (formerly Crimea Reserve) to maintain Council’s commitment to “extend, connect and diversify our open space network to cater for increased demand” (Council Plan Direction 4.1C) and “to provide and maintain vibrant outdoor play spaces that create opportunities for fun, adventure and learning for all” (Council Play Space Strategy 2012). Two stages of community consultation were run in October 2017 and March/ April 2018 to give the community the opportunity to provide ideas and feedback on the landscape upgrade. The final design has evolved in line with your feedback from the previous three stages of community engagement. We’d like to check in one more time before we finalise our construction documents and get your response to the following key questions about the Play Space. Privacy statement: All responses are anonymous and no IP addresses are tracked. Any feedback made via this questionnaire may be published and used as part of Council promotional materials. Please contact the Open Space team on 9209 6777 for any queries. 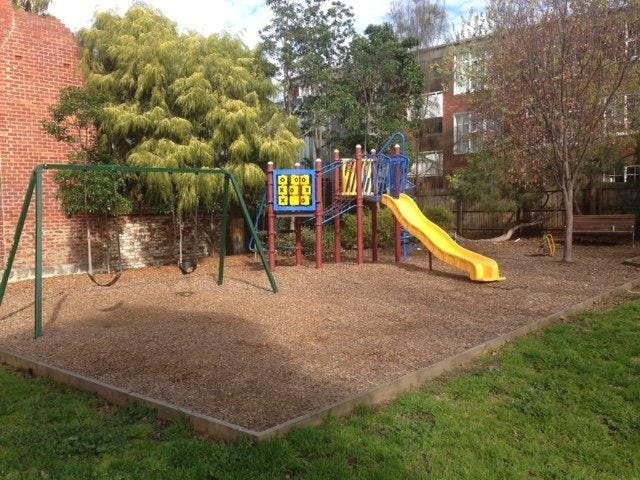 Why use timber play equipment when it wears easily? Where will rubbish bins be placed, and will there also be recycling bins? Feedback from a number of residents indicated a preference for natural materials in the small space to blend in with the surrounding environment.The engineered Robinia timber has been selected because it is durable, sustainable and designed to wear slowly over time. Yes, irrigation will be included to help establish and maintain grass, trees and garden beds. Feedback from earlier engagement included requests for high quality bins. A dual stainless-steel rubbish and recycling bin was selected and placed along the central walkway for easy access. The park is designed for daytime/early evening use and street lighting is considered adequate for that purpose. This upgrade is designed for children, young people, carers and the local community to play, socialise and relax together. Is access provided for truck parking? Yes, access for light maintenance trucks is provided on Charnwood Road. Why isn’t fencing not provided? Council installs fencing in response to site specific safety issues only, such as proximity to busy roads. Fenced play spaces limit the points of access to play facilities and the surrounding play space, as well as creating an aesthetic impact that is at odds with the idea of an open space and can encourage carers to take less responsibility for the supervision of children. As part of this upgrade, new gardens beds will be put in along Crimea Street and Charnwood Road to create an informal barrier. Is there shade provided for the summer months? Feedback received during earlier engagement requested a combination of sunny spots and shaded areas. In the proposed design, tree canopy will provide some shade, and the design also allows for sunny areas. Why is there a proposed path through the middle of the park? A path through the middle of the park has been proposed to create an entrance and exit, and to influence where people walk (minimising maintenance of informal paths). Why can’t the footpaths be curved and moved closer to the Charnwood Road and Crimea Street kerbs? Relocating and reshaping the footpaths would make meeting Disability Discrimination Act and public access requirements challenging. The process of reshaping and relocating the paths would also add significant costs to the project, increase the project timelines as well as increase the impact to park users.